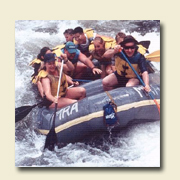 Royal Wheels India is an adventure travel group organising Camping Holidays in India. Day 01 : Board the overnight Mussourie Express to Dehradun from Delhi departing from Old Delhi Railway station at 2220 hrs. This will be a night journey. Day 02 : Arrive at Dehradun 0745 hrs. You will board waiting vehicles and drive to Camp in time to arrive for lunch by 2pm. Welcome drink over camp briefing, check into tents and relax. After lunch, we collect for a safety briefing at Camp and board rafts for a short raft trip till Khunigad. We then drive back to Camp for tea/coffee. Campfire dinner and overnight at Camp. Day 03 : An early morning starts with Tea/coffee served at 7:30 am . After breakfast at 8:30, we drive to Mori village and raft down rapids till Khunigad, stopping for refreshments at Camp enroute. Drive back to Camp from Khunigad for hot lunch. Volleyball/cricket or an optional hike up the Lunagad creek for a swim in its deep pool. Return to Camp by teatime. Campfire dinner and overnight at Camp. Day 04 : Today, we take a short drive to Miagad and begin the trek to Kedar Kantha. 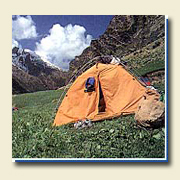 We pitch Camp mid-way and sleep in small trekking tents. Overnight camp at Gujjar Thach. Day 06 : The day at Kedar Kantha is spent taking short hikes around the Camp area. Overnight camp.